This article consists of two parts, follow the link to visit Easter Island, Patagonia and Southern Chile. If you have planned traveling to the South of the World, specifically Chile and you need to know what places are the most interesting to visit, here you will find a guide with the best places to visit in Chile. The country has a wide variety of tourist attractions as well as a range of environments and climates, a condition that few places can offer. In recent decades, Chilean tourism has received more and more recognition, to the point that only in 2017 the country received 27 International Awards in various categories, including Destinations and Infrastructure. Without going any further, the famous Lonely Planet Tourist Guide recently classified the Elqui Valley, in the Coquimbo Region, Chile, as one of the Top 10 UNMISSABLE places to visit in 2019. First of all, we must say that in Chile is often talked about two Norths, the "Norte Grande" (Big, Great or Far North) and the "Norte Chico" (Small. Little or Near North). The Norte Grande is mostly occupied by the Atacama Desert, a place so arid that it has been used by NASA to test its Mars Rovers, this very special condition makes the region a place of great attractions, as well as being a territory of great archaeological wealth where have been found Mummies much older than the Mummies of Ancient Egypt. (See Wikipedia's article on Chinchorro Mummies). Certainly, Atacama Desert and the Altiplano are the places where most of the tourist attractions of the Norte Grande are concentrated although the Norte Chico does not lag behind, the aforementioned Elqui Valley being one of the most renowned. One of the most beautiful Natural Sanctuaries in Chile, located in the commune of Putre, Arica y Parinacota Region. The Park highlights the archaeological wealth, the dominant Aymara culture of the area, the rich wildlife of the Altiplano, and the many places that can be seen such as Lake Chungará, the Cotacotani Lagoons and the Payachatas (Parinacota and Pomerape) volcanoes. This is also a great destination for lovers of mountaineering. The surface area is 137,883 hectares and the altitude varies between 3,200 to 6,342 meters above sea level, so you should avoid rough exercise. This Museum depends on the Universidad Catolica del Norte and is located in San Pedro de Atacama, known as the "Archeological capital of Chile". Named after the distinguished Belgian Jesuit priest Gustavo Le Paige, who devoted most of his life to the search, collection and study of archaeological remains in Northern Chile. It keeps about 380,000 pieces belonging to the Atacameña Culture, (300 B.C. - 900 A.C.), strongly influenced by the Aymara and Quechua cultures. Valle de la Luna, situated 13 Km. 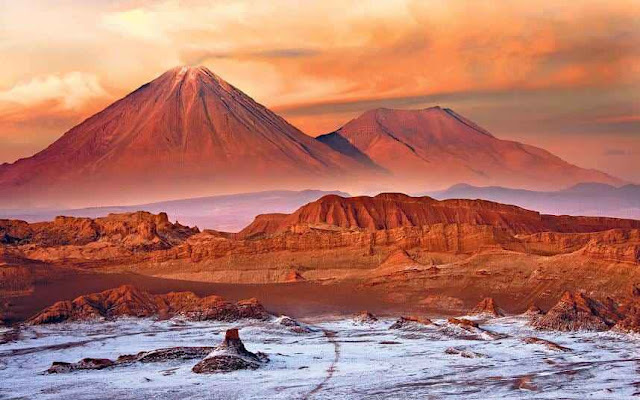 West of San Pedro de Atacama, is one of the most famous tourist spots in the North of Chile, an unmissable tour when visiting this part of the country. Its main features are its huge sand dunes, valleys, hills and formations of rock and salt. The landscape resembles a view of the Moon, as a result of the fusion of the Desert with the Mountains, which gives rise to strange formations of sand and rock. Very close, just 2 km from San Pedro de Atacama, is located El Valle de la Muerte (Valley of Death), in the middle of the Cordillera de la Sal (Salt Mountain Range). Its name comes from ancient times, when the one who tried to cross it, died in the attempt. The place is so dry, that no vegetation grows nor any insect lives there. 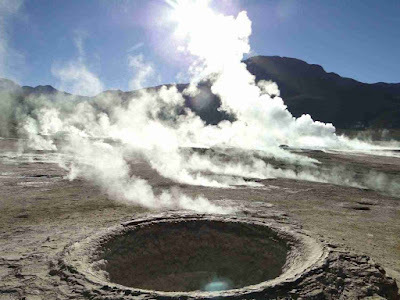 El Tatio Geysers, a view like from another Planet... Located 95 km East of the town of San Pedro de Atacama, at about 4,200 meters above sea level (the height here makes the water boil at only 86° C.) El Tatio is the largest group of Geysers in the Southern Hemisphere (about 80 active fountains) and the third largest in the World. Its name in the extinct Atacameño or Kunza language would mean "the crying grandfather". Tours leave very early in the morning, between 04.00 to 05.00 as the best view is achieved between 06.00 and 09.00 hrs. The skies of Northern Chile (Norte Grande and Norte Chico) are considered the best in the World for Astronomical Tourism. It is worth mentioning that currently, Chile has 70% of the world astronomical instrumentalization in its territory. Countless Research Organizations and Tourist Companies are installed here taking advantage of the conditions offered by this part of Chile either by its atmospheric environment, economic considerations (of the country), stability, etc. Many of these Observatories can be visited making the corresponding reservations in advance via Internet. However, in most cases you can hire a tour in the local agencies to visit one of the many Tourist/Educational Observation Centers. Outstanding are the scientific facilities such as the ALMA, the largest radiotelescope in the World, consisting of 66 high-precision antennas. You can request a free of charge entry pass to visit the ALMA Operations Support Facility Here. Detailing a complete list of observation points of scientific and touristic nature would be very long, let's leave this in the hands of a specialist in Astronomical Tourism Here. With more than 4,000 km of coastline, Chile has beautiful beaches that are worth to visit and enjoy. The beaches of the North of Chile, all bathed by the South Pacific, are characterized by their warm waters. 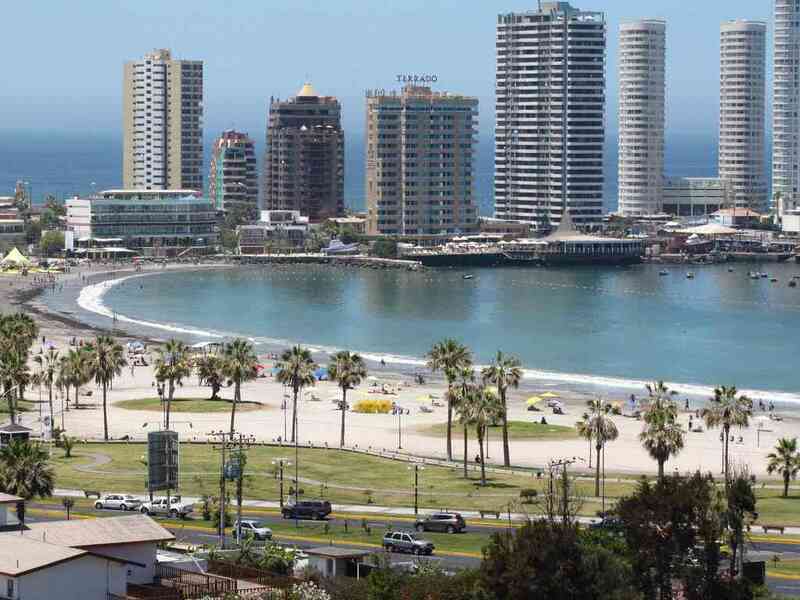 Currently, one of the most popular beaches is Cavancha, located in the center of Iquique, featuring gentle waves, white sands, recreational areas, Palm trees and Restaurants very close, suitable for the whole family. Like all the beaches in this part of Chile, the waters are warm in Summer and cold in Winter, but never like in the South of the country. The nearby dunes allow the practice of paragliding, a very common sport in Iquique. In the city of Arica, following Comandante San Martin Avenue you can go to the beautiful La Lisera Beach, of semicircular shape and approximately 150 meters long, without large waves, suitable for swimming and diving. Because of its mild climate, it can receive visitors throughout the year. 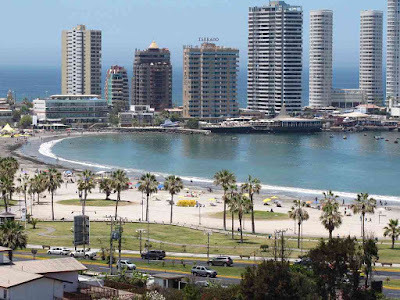 Another great tourist destination is the city of La Serena, in the "Norte Chico" (Smal North). Along the Avenida del Mar, there are 12 beaches, almost all suitable for swimming and with first class facilities to receive bathers. In the Third Atacama Region, 6 km South of Caldera is the Resort village of Bahia Inglesa, famous for its white sands, turquoise, warm and gentle waters. With approximately 12 km long it is ranked as one of the best in the country featuring several beaches: La Piscina (surrounded by rocks) ideal to go with children; Playa Blanca, Playa El Chuncho and Las Machas. Santiago, the Chilean capital, because of its surroundings full of attractions and its own attributes is considered one of the best tourist destinations in the World, because of its privileged location in a fertile valley at the foot of the Andes Mountains, as well as for its historical heritage, dynamism, quality of life and great progress in all aspects. The city of about 7,000,000 inhabitants is composed of a historic center and around by many communes from popular to very modern districts with large skyscrapers, shopping malls and financial centers that have nothing to envy to the great capitals of the world. Here you can see the main places to see in Santiago. Santiago also offers a wide variety of Museums where you can learn more about its History, people, natural wonders, art and culture, etc. Click to see the main Museums in Santiago de Chile. There is a vast network of Parks within the city and natural areas in the vicinity, to name just a few: Parque Metropolitano also known as Cerro San Cristobal (San Cristobal Hill), the fourth largest urban park in the World an one of the must-sees in Santiago, halfway up the hill you can visit the National Zoo, and at the top, the Sanctuary and statue of the Inmaculada Concepcion. In the summer season you can also visit the Tupahue and Antilen Swimming Pools and year round take and enjoy the Cable Car, recently modernized and re-inaugurated. The park is also made up of Chacarillas, Los Gemelos hills and other areas that constitute a small mountain range within the city. In the heart of Santiago is located Cerro Santa Lucia (Santa Lucia Hill), much smaller than the San Cristobal but not less beautiful, also with a wonderful view from the top and a great historical value because, sheltered by this hill, the city was founded in 1541. Another old urban park of the city is Parque Forestal, on the South bank of Rio Mapocho. Important cultural and recreational activities are carried out here. Throughout the Parque Forestal, from its western limit with the Parque Balmaceda to the Parque de los Reyes on the eastern end, you can find important places that make it even more attractive, like the Museo Nacional de Bellas Artes, the Museo de Arte Contemporaneo, important sculptures and monuments such as the Fuente Alemana (German Fountain). Parque Araucano, another of the large and major parks of Santiago, located in the Commune of Las Condes, with lots of attractions for all ages. 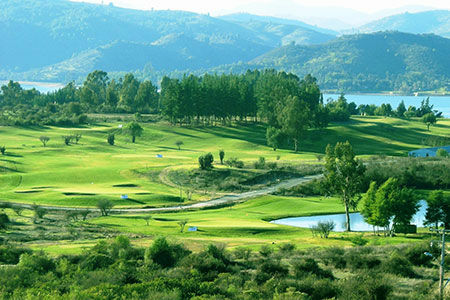 Parque de los Reyes, Covering 31 hectares of gardens and green areas in the Commune of Santiago. It was built for the 500th anniversary of the discovery of America and in honor of the Monarchs of Spain on their visit to Chile. It has an athletic circuit, playgrounds, an artificial lagoon and the Fuente de España. In the outskirts, on the foothills of the Andes Mountains there are world-class Winter Centers, which receive skiers and tourists from all over the globe. The main and best equipped facilities are Valle Nevado, La Parva, El Colorado/Farellones all at an average of 50 km East of Santiago. A little further North (147 Km., in Valparaiso Region) is located Portillo Ski Center, the oldest in South America, also with excellent facilities and where national teams from Europe and North America come every year to train on its slopes. Cajon del Maipo is one of the most visited natural areas around the Chilean capital. 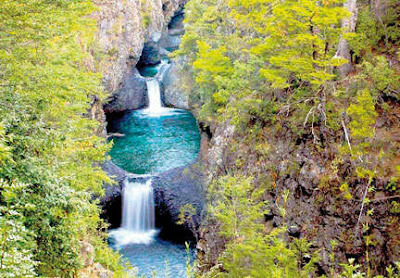 It is a canyon located only one hour away from Santiago, along the basin of Rio Maipo at the foot of the Andes Mountains, being a frequent destination for lovers of ecotourism and adventure tourism. The main town is San Jose de Maipo. Here you can see the main points of interest of Cajon del Maipo. Chile is a country renowned worldwide for the production of quality wines. Most of the Tourism Agencies offer innumerable tours to visit the vineyards in the surroundings of Santiago and Central Chile. These itineraries through the wine producing regions are known as Rutas del Vino (Wine Routes). Another typical place near Santiago, just 50 km away is the small town of Pomaire, on the side of Route 78 or Autopista del Sol, on the way to San Antonio. Pomaire is the symbol of Pottery in Chile, besides being well known for its traditional cuisine. Click here for more information about Pomaire. 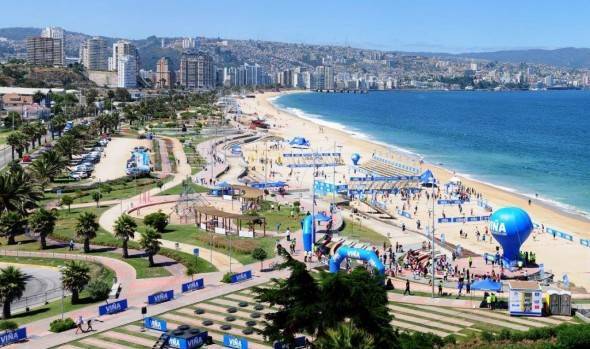 Although with marked differences, the cities of Valparaiso and Viña del Mar, located only 120 Km. 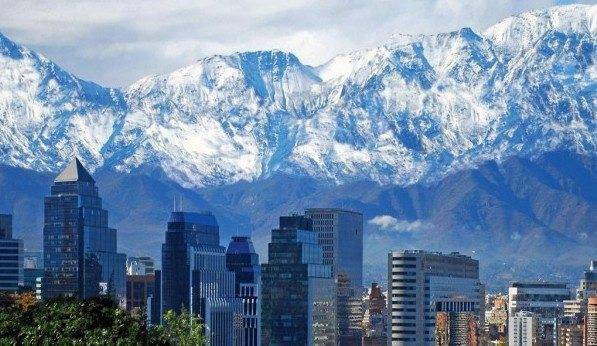 from Santiago, are also icons of tourism in Central Chile. Because of the growth they have had, the cities are currently united, only administratively apart. Valparaiso is the main port of Chile, its historic center was declared a World Heritage Site by UNESCO and has many interesting places to tour. Visit this page for more tourist information about Valparaiso. For its part, Viña del Mar, known as La Ciudad Jardin (Chile's Garden City) is, without a doubt, one of the capitals of national tourism. Viña del Mar is mainly known for its beaches, its large number of green areas, beautiful buildings looking directly to the Pacific Ocean and the excellent infrastructure to receive tourists. Here you can find more tourist information on Viña del Mar. Campamento Minero Sewell (Sewell Mining Camp), today uninhabited, it was the first Copper- mining settlement in Chile. Declared a World Heritage Site by UNESCO in 2006, it can be visited throughout the year because it is open to tourism. Its location is in the middle of the Cordillera de los Andes, 150 km South of Santiago and 64 km from Rancagua, the regional capital. A must-see in Sewell is the Museo de la Gran Mineria del Cobre (Large Scale Copper Mining Museum). Museo de Colchagua (Colchagua Museum), a private institution, managed by the Cardoen Foundation, located in the commune of Santa Cruz, Region of Libertador Bernardo O'Higgins. It was inaugurated in 1995, the main construction that houses the Museum and 60 percent of its collections were damaged by the February 2010 earthquake. It stayed closed for several months and was reopened in October of the same year. Colchagua Museum is one of the most comprehensive in Chile, very well organized, covering a variety of topics and it is very easy to get there from Santiago. Here you can learn more about Museo de Colchagua. Lago Rapel (Rapel Artificial Lake), is an 80 km2 artificial reservoir located in the O'Higgins Region, bordering the Santiago Metropolitan Region. It was built in 1969 to feed the Rapel Hydroelectric Plant. Because of its attractive environment, in recent decades, tourism has developed significantly in the place to become an important destination for lovers of sport fishing and all kinds of water sports, at any time of the year. There are varied facilities of good level such as Marinas, Hotels, Restaurants, Camping sites, Cabins, Rental Equipment, etc. Pichilemu, the Chilean Capital of Surfing, small town and commune located in O'Higgins Region, also known as Chile's Sixth Region. Its main point of attraction is Punta de Lobos Beach, located 6 km. South of Pichilemu. Depending on the time of year, the waves can reach from 8 to 10 meters in height, in 2013 Punta de Lobos was named World Surfing Reserve by Save the Waves Coalition, a title that has made it one of the favorite destinations for surfers from around the world. Parque Nacional La Campana, located in the so-called Cordillera de la Costa (Coastal Mountain Range), Region of Valparaiso, 160 km. Northwest of Santiago and 29 km. from the city of Quillota. This National Park is managed by CONAF (National Forest Corporation). The Protected Area includes fauna and flora representative of Central Chile, its Palm forests are the largest in the country. In 1834 the English naturalist Charles Darwin reached the hill top that today gives the name to the Park, La Campana (The Bell). La Campana was declared a Biosphere Reserve in 1985 and defined as a Place of Scientific Interest for mining use in 1989. Another interesting fact is that from the top of the hill, on a clear day, you can see the Andes Mountains to the East and to the West, the Pacific Ocean, 2 natural borders of Chile. Other important National Parks of Central Chile are Parque Nacional Radal Siete Tazas, located in the commune of Molina, Maule Region, 100 km. from Talca, the Regional Capital and 275 km. South of Santiago. The main attraction is Rio Claro (Claro River), whose bed of basaltic rock has been molded by water over the centuries, forming a series of waterfalls and pools, surrounded by vast vegetation. The name of Siete Tazas (Seven Cups) is precisely due to the sequence of 7 waterfalls in the middle of the magnificent natural environment. On the distant Easter Island, located 3700 km. from the coast of continental Chile, lies Rapa Nui National Park, occupying a little more than 40 percent of the surface of the volcanic origin Island, including much of the most important tourist and archaeological sites. Let's remember that the mysterious Rapa Nui culture had its maximum splendor between the IX and XV centuries, when the carving of Moai reached its maximum apogee. Click to learn more about Easter Island National Park. Parque Nacional Archipielago Juan Fernandez, another remote National Park, declared Biosphere Reserve by UNESCO in 1977. It is located at Juan Fernandez Archipelago, 667 kilometers from the coast of San Antonio, Valparaiso region, continental Chile. It covers a total area of 18,300 hectares, distributed between the main island of Robinson Crusoe and the islands Alejandro Selkirk and Santa Clara. This Natural Sanctuary contains one of the most unique and surprising ecosystems on the planet, it has its own flora, being one of the richest places in native plant life around the World. Here tou can learn more on Juan Fernandez Archipelago. Salto del Laja (Laja Falls), 4 waterfalls belonging to the Laja River, located in the region of Biobio, sometimes considered within the Southern Zone of Chile, (not Central Chile). Laja Falls are located 479 km. South of Santiago and 31 km. from Los Angeles, the nearest city. The view of Salto del Laja is one of the iconic postcards of tourism in Chile. In the place there is a complete infrastructure to serve tourists: Hotels, Restaurants, Camping areas, Trails for trekking, Canopy, Horseback riding, Sailing, etc. The tours to visit Saltos del Laja depart from the Bus terminals of Los Angeles or Concepcion, the regional capital.